Sault Ste. 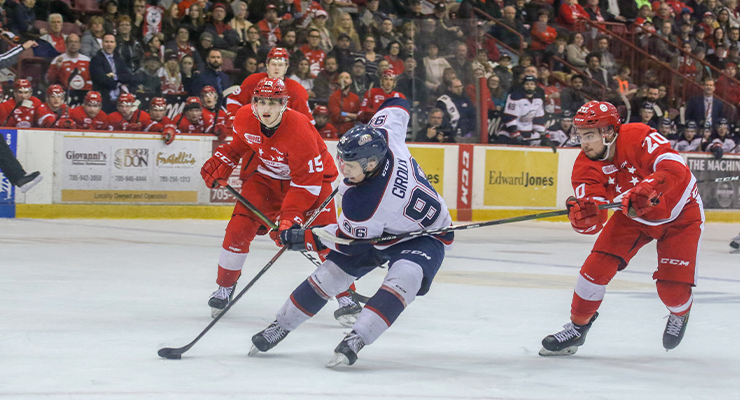 Marie, ON – The Saginaw Spirit will once again try to eliminate the Soo Greyhounds from further playoff contention with a victory Sunday, April 14. Puck drop for Game Six from the GFL Memorial Gardens is set for 7:07 p.m. The Spirit own a 3-2 series lead. Saginaw dropped the last two games of the series after they defeated the Soo in the series’ first three games. Fans can follow all the action on the flagship Newsradio WSGW 100.5 FM and fmtalk1005.com with Joey Battaino and Dennis Desrosiers on the call. “Countdown to Face-off” begins 15 minutes prior to puck drop for all your pregame coverage. Fans can also watch the game live from the Saginaw Spirit “Watch Party” from the 2690 Tittabawassee Road Buffalo Wild Wings location. Saginaw’s shorthanded unit began the post-season perfect 30-straight man-power disadvantages but the Soo has scored a goal in their last two man-power advantages. The Spirit have gone zero-for-four in the last two games on the man-power advantages which dropped the unit to ninth in the OHL post-season power play rankings. Game six will feature two of this season’s Ontario Hockey League (OHL) top-three post-season scorers. The Greyhounds’ Morgan Frost (18) and Saginaw’s Owen Tippett (17) are two and three on the OHL’s post-season scoring list. 2017 Philadelphia Flyers first-rounder Frost has been on a tear in the past two games against the Spirit. 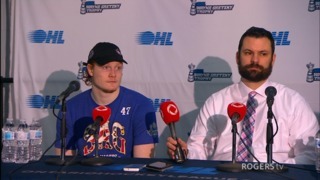 The Aurora, Ontario native scored three goals and four assists in Game’s Four and Five after Saginaw held the center to just two points in the first three games of the series. Tippett, the 2017 Florida Panthers 10th overall pick, started this season’s playoffs on a seven-game goal streak. 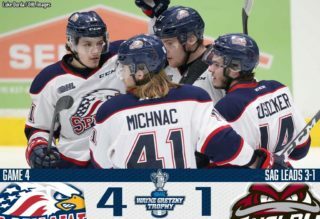 The Saginaw right-winger began the Round Two series with three-straight, three-point games against the Soo Greyhounds. New York Islanders signee Bode Wilde tallied one of the Spirit’s two goals in Game Five on a great individual effort. The 2018 second-rounder of the Islanders has five post-season goals this year for the Spirit. 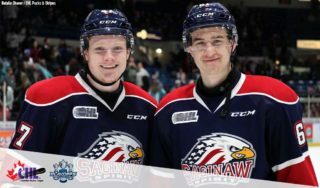 Saginaw’s Hayden Davis and Ryan McLeod are tied for second in this year’s OHL playoffs with a plus/minus rating of plus-11. Davis has been an excellent addition for the Spirit since the defenseman missed 15 games due two injury. The Hamilton, Ontario native has been a plus-15 for the Spirit in the 14 games since his injury. McLeod, an Edmonton Oilers second round pick, is third among Saginaw players in points during this post-season. The Saginaw center collected an assist in Game Five’s loss to the Soo. Arizona Coyotes prospect Ivan Prosvetov is fifth this post-season in the OHL with a 2.59-goals against average. The Russian net-minder is ranked third this post-season among OHL goaltenders with a .924 save percentage. Los Angeles Kings third-rounder Matthew Villalta has stopped 66 of the Saginaw Spirit’s last 68 shots. Villalta, who signed with the Soo as a free agent in 2016, has the only shutout suffered by the Spirit this season. Sault Ste. Marie captain Barrett Hayton has been hot in the last three games against the Spirit. The 2018 fifth overall pick of the Arizona Coyotes has two goals and four points in the center’s current three-game point streak. Soo right-winger Jaden Peca scored two goals to collect Game Five’s second star honors. The former 2016 Barrie Colt draft pick has four points in the last two games against the Saginaw Spirit. The OHL announced Saturday Peca would be suspended for the remainder of the series (two games) for an inappropriate gesture made in Game five in Saginaw. If necessary, the Spirit will return to The Dow Event Center for Game Seven on Tuesday, April 16 at 7:05 p.m. against the Soo Greyhounds. 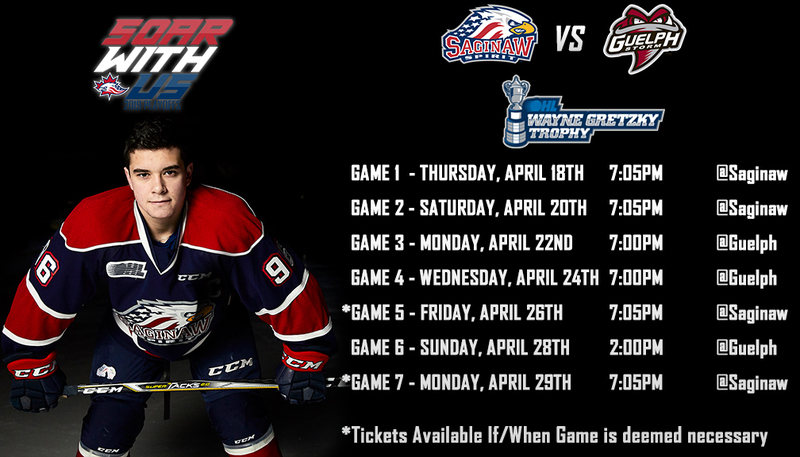 Tickets for Game Seven *if necessary* will be available this Saturday, April 13 on saginawspirit.com, ticketmaster.com, and at the Saginaw Spirit Store at 5789 State Street in Saginaw. The Spirit store will be open from 11 a.m. to 4 p.m.